Want to be notified of new releases in nodes-vapor/ironman? Fork this example project as a boilerplate for working with Vapor. Check out the live demo running on Ubuntu. Swift 3.0 preview 2 is required (Xcode 8 beta 2 on macOS). Works on Ubuntu, Docker, Heroku, macOS. Run the following script to check if you have Swift 3.0 beta 2 properly installed and configured. Visit Getting Started in the documentation. If you have the Vapor Toolbox, use vapor new <project-name> to create your new application. Then run vapor build and vapor run. 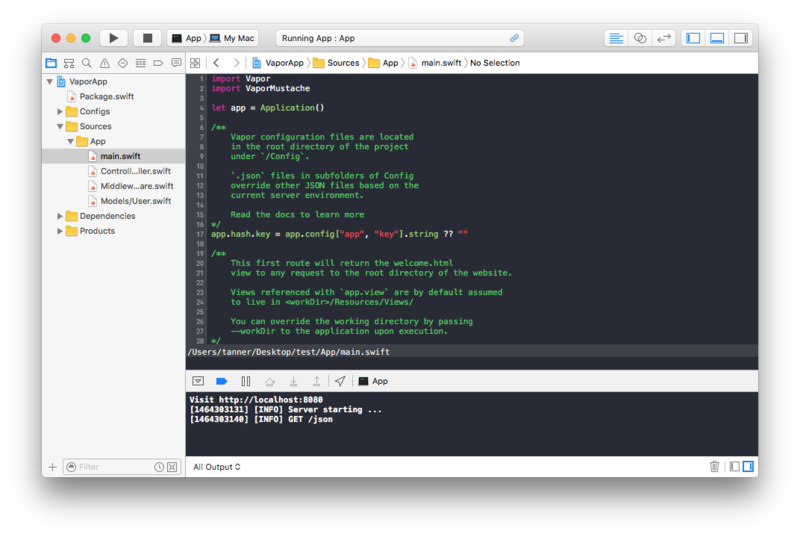 Otherwise, clone this repo and run swift build to compile your application, then run .build/debug/App. Run vapor xcode which will create the Xcode Project and open Xcode 8. Check the Vapor documentation for more in-depth deployment instructions. To start your Vapor site automatically when the server is booted, add this file to your server. You may need to install Upstart if it is not already on your installation of Linux. You additionally have access to the following commands for starting and stopping your server. The following script is useful for upgrading your website. Use the vapor heroku commands in the Vapor Toolbox to push to Heroku. You can run this demo application locally in a Linux environment using Docker. Make sure you have installed the Vapor Toolbox. Ensure Docker is installed on your local machine. You can also run your Vapor app through Nginx. It’s recommended you use Supervisor to run the app instance to protect against crashes and ensure it’s always running.